Mr. Parfenov was born in Bashkiria (Russia, USSR) in 1946. Graduated from the Musical College of Frunze (now Bishkek, Kyrgyzstan) in 1966. Studied in the Tashkent State Conservatory (degree MA in Music in 1972). In 1973 -1979 - the soloist of the Uzbekistan State Radio and TV Orchestra. He played in the jazz ensemble "Boomerang" (Alma-Ata, Kazakhstan) at jazz festivals in Fergana, Yaroslavl, Novosibirsk, Moscow in 1979-1984. 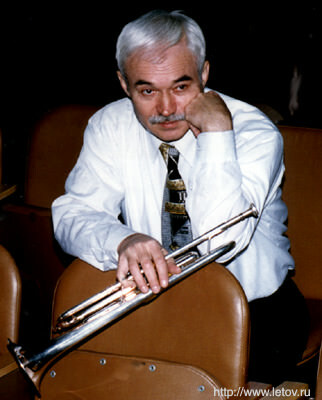 Since 1984 Mr.Parfionov is the soloist of the Oleg Lundstrem big band (Moscow). He played with that band at the jazz festivals all over the Soviet Union, Czechoslovakia, Bulgaria, Holland, USA, Finland, Greece, Turkey, Israel, Egypt, China performed with Natalie Cole. Mr. Parfionov played as a soloist with the Jazz Orchestra of Illinois University led by John Harvey. February-March 1993 - India International Music Festival with the Jazz Quartet led by N.Panov in Delhi, Bombay, Calcutta, Madras, Bangalore, Pune. September 1993 - Jazz Festival in Lyon - member of the International Jazz Band together with Johnny Griffin, Zbigniew Namyslowski, Deborah Brown. Mr.Parfionov plays in TRI"O" since 1992 (tour on Switzerland in 1994). Together with Moscow Composers Orchestra he made a tour in Lithuania, Germany in 1994. Since 1997 Yury Parfenov plays in "Embryo"
December 1999 - the last jazz transmission of Millenium at West Deutsche Rundfunk (WDR, Cologne) - with TRI-O, Mal Waldron, Jean Lee, Blixa Bargeld, Roman Bunka, concerts with TRI-O in Munich.